I’ve started drinking coffee over the last few years. Like most things I’ve picked up relatively late in life, I am kind of a snob, in that I want good coffee but I want it to be quick, easy, and cheap. This post is about the gear I’ve settled on for making my morning cup. There’s a wide range of gear you could build up, from super-cheap to really nice, and in general the more expensive, the better coffee you’ll make. I am a middle-of-the-road, Pareto Principle kind of guy. I want coffee that’s 80% or more as good as the best coffee from experts, at a fraction of the cost and effort. Here’s my list of “best value and balance” gear. As a bonus, some of my gear items are things I already had (kettle, Brita pitcher) so my coffee habit really didn’t entail adding much more equipment. Whole-bean coffee has to be ground before making it. You can read lots of details online about why grinding just before brewing makes better coffee. I notice a difference, and that’s enough for me. My personal preference is to stick with something pretty simple and not all that expensive, somewhere in the range of $6.00 to $8.00 for a bag or can. I’m currently enjoying several of the blends from Trader Joe’s. My wife likes Central American beans, and I like those too; I once visited a coffee farm on the slopes of a mountain in Costa Rica so it evokes fond memories. I also enjoy Arabica. I like a medium or dark roast most of the time, but there’s an infinite variety of beans, blends and roasts, and various combinations of them are better or worse. 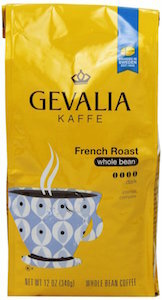 Another decent middle-of-the-road brand is Gevalia, which tends towards the better-quality range of not-too-expensive coffee. As a bonus, many of their roasts come pre-ground. Sometimes the convenience of pre-ground is just what I need. There are two kinds of grinders: conical burr, and ones that aren’t worth using. The conical burr grinders produce a better, more uniform grind, without all kinds of smashing and splattering of oils and other carnage and destruction. The only problem is most conical burr grinders are several hundred bucks. There is a bargain grinder, though, and it’s awesome. 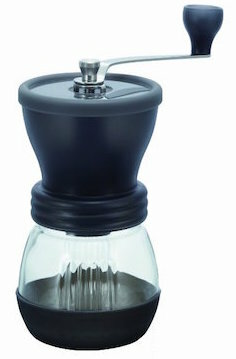 It’s the Hario Skerton, a Japanese hand-grinder that fits on top of a little jar. It’s easy to use and produces a good quality grind, it’s durable and doesn’t break, and it is not expensive at all. The current price on Amazon is $32, and there’s a rebranded version of it at a similar price. One or the other is sometimes cheaper or more expensive. The catch? If you set it to a very fine blend, it’ll take a while to grind. Some people also complain about having to grind by hand. I honestly do not know why. It is easy to grind, especially if you hold it in the air instead of trying to hold it still on a counter-top, and enough coffee for a cup or two takes less time to grind than the water takes to heat up. Heating water properly is a big part of a good cup of coffee. If you just boil water on the stove, you’re going to get a nasty, bitter cup for sure. Your water needs to be the right temperature; it varies by roast and personal taste. You can buy a simple thermometer, but in my opinion the easiest and cheapest way to get water the right temperature is to use a programmable electric kettle. The one I like, and have used several times a day for years (I drink one small cup of coffee in the morning but many cups of tea all day long) is the Oster BVST-EK5967-NP. It’s $30 on Amazon. If you click through the link and look at the reviews, you’ll see everyone complaining about it being cheap and failing after a short while. I don’t know what the deal with that is. I had a friend who got scared off by the reviews, bought a highly-rated one instead, and I’ve used it a ton. It is awful compared to the Oster—doesn’t turn off properly, doesn’t heat quickly, doesn’t alarm when done, and doesn’t have a temperature control. The Oster has been great for me. It’s possible that the Oster has changed since I got mine, though, and it may indeed be lower quality now. I heat the water to 190° F for most of my coffee. 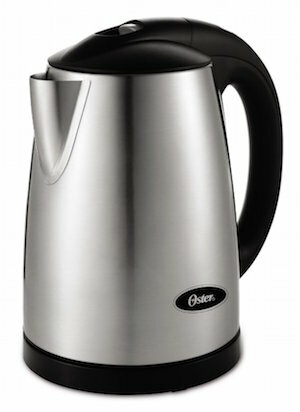 It’s easy with this kettle: press twice on the minus button, press Start. About a minute later it’ll be done. As a bonus, using an electric kettle like this is much faster than a pot on the stove, and I wouldn’t be surprised if it uses less electricity. Tap water, with all of its nasty chemicals and minerals, definitely doesn’t make as good a cup of coffee as filtered water. 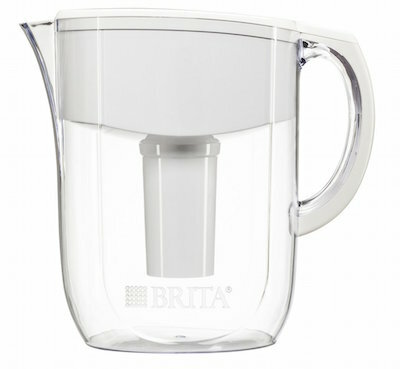 I use an ordinary Brita pitcher. If you want to know how much difference this really makes, try the little Brita test: make two cups of tea, one with tap water and one with Brita water, in transparent glasses. Just any standard tea will do. If your tap water is anything like mine, you’ll be shocked by the difference in appearance alone. The only downside to using a Brita filter is that you need to remember to change it every so often. My compromise is Aeropress. It’s not really a “compromise” since I think it’s great coffee by any standard. 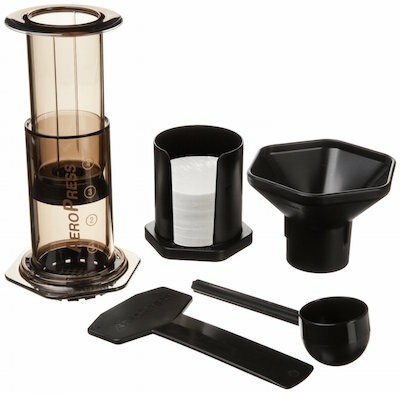 Aeropress coffee is about as close to an Espresso as you can get without making real Espresso. The emphasis is on the coffee’s flavors—the oils, aromas, and organic compounds—and not just bitterness, which is all I taste with most “standard” American coffee. There is more, too. A cup of Aeropress coffee is super-quick and simple to make! I only use half of the parts that you see in the picture above: the press, scoop, and mixer. I have no use for the funnel or the filter dispenser. And, if you do like a larger serving and a more traditional American taste (less strong), just add hot water to your Aeropress Espresso and you’re there. Aeropress is also small enough to take with you when you travel. No more disgusting coffee from the hotel lobby. There’s a lot of science behind why Aeropress coffee is not bitter and tastes better. You can read about it on the Amazon page. It also comes with good instructions that explain the correct temperature for your roast, how long to mix and press, and so on. It’s also very cheap. The Aeropress comes in at $25 or so, far less than any other decent coffee maker I’ve found, and filters are super-cheap (and reusable 3-5 times too). I have tried drip, percolator, French Press, pour-over, and a bunch of other coffee techniques. Like I said, Aeropress is easily the best coffee given the ease and price. Partially due to the Aeropress’s size, and partially because I like my mug to be a little bit small and nicely decorated, I bought the following stack of 4 mugs with a wire stand from World Market. The Aeropress fits just right on top of them. They’re just a bit smaller than most of the mugs I’m used to. 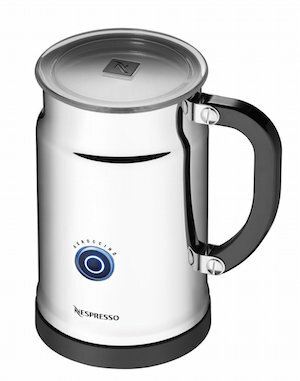 If you like lattes and mochas and the like (which I do—see my pumpkin spice latte recipe), then you might like the Nespresso Aeroccino Plus Milk Frother. 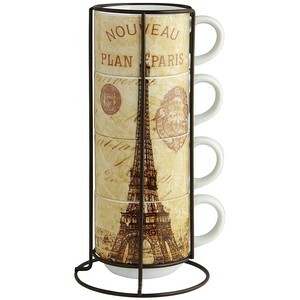 Years ago I got one of these for my wife as part of a Nespresso kit, and I still use it. With whole milk, or even 2% milk, it does a great job of producing a nice frothy batch in no time. Drop in some chocolate syrup before foaming (Trader Joe’s and Whole Foods both have good-quality organic chocolate syrup) and you’ve got a pretty decent mocha. The frother is easy to use, fast, and easy to clean. On that subject, I do like Nespresso too. It makes a pretty good Espresso, all things considered, though not as good as a “real” one by any stretch. My gripe with it, and all similar capsule coffee makers such as Keurigs, is the cost. You can drop a weekend getaway’s worth on an order of Nespresso without blinking, and it will be gone before you know it! By contrast, my Aeropress with a single scoop, hand-ground, is probably 20 times cheaper per cup. All the rest is gravy. I’ve included some decidedly non-essential items in this post, because I enjoy them and they’re part of my overall experience, but you can certainly get by with much less. For example, if I wanted to be really minimalistic (as I am when traveling) I can make do with just the Aeropress and a bag of Gevalia, pre-ground. Voila. I hope you enjoy your coffee. Let me know your thoughts and ideas!